Our Company - CSC Awnings Inc. Since 1999, CSC Awnings, Inc. has been providing quality canopies and awnings to commercial customers in the eastern United States. We take pride in our work and strive for excellent customer service. 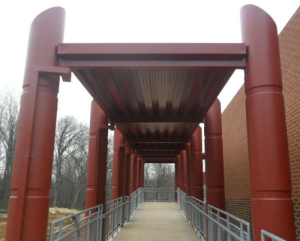 We provide Extruded Aluminum Canopies and other systems to meet the needs of every customer. Our canopies and awnings are fully warranted and installed professionally. We specialize in Extruded Aluminum Canopy Systems, Roll-Formed Aluminum Canopies and Metal Awnings. We offer custom designs with engineering to meet current codes. In addition to our canopy systems, we offer fabric and vinyl awnings. Contact us for a free estimate. CSC Awnings serves the eastern United States. We service projects in Pennsylvania, West Virginia, Virginia, North Carolina, South Carolina and many other states. We have worked with great customers such as Magnolia Construction, Battleground Restaurant Group, Landmark Builders, Shelco and more.